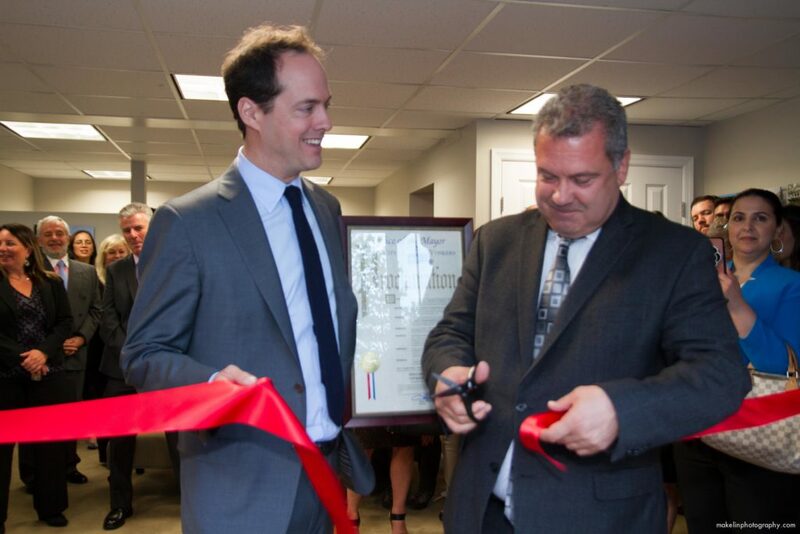 From left, Houlihan Lawrence’s Chris Meyers and Yonkers Mayor Mike Spano cut the ribbon at the brokerage firm’s renovated Yonkers office. YONKERS— Following an extensive remodel and expansion project, real estate brokerage firm Houlihan Lawrence recently held a grand opening event for its Yonkers office. Guests including Yonkers Mayor Mike Spano, Houlihan Lawrence CEO Stephen Meyers and President Chris Meyers, enjoyed cocktails and hors d’oeuvres. The ribbon cutting ceremony at the 55 East Grassy Sprain Road office included Mayor Spano presenting the office with an official City of Yonkers Proclamation. The Yonkers Houlihan Lawrence brokerage office, led by branch manager Aaron Velez, serves five communities including Yonkers, Mount Vernon, Riverdale, Tuckahoe and the Bronx. The expansion of the office is a broader reflection of the success and permanence of Houlihan Lawrence in Yonkers, company officials state.